On Saturday I held a workshop at my home studio. 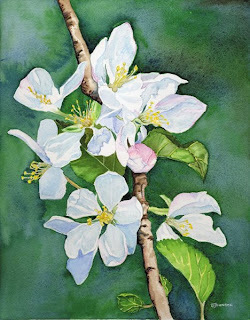 We painted some apple blossoms. We started with watercolor pencils to draw in the delicate reflected lights and shadows of the blossoms and some of the leaves. Then, we used the paints from our palettes to work in a wet-in-wet background and to flesh out the other areas of the painting.